Last December, my husband totally surprised me with a silhouette cameo! I guess he really did hear me when I was talking about how much I wanted a silhouette cameo! Let's just say I was really surprised!! As thrilled as I was about being the proud new owner of a silhouette, I'm embarrassed to say, it sat in my craft room for almost 8 months before I really started using it! In my defense, it was a week before Christmas he gave it to me and on top of that I was working a lot! But, still it's all about making time to do things that we want to do! So I've made it my personal goal this year to do at least one project a month with my silhouette! So far, I'm keeping up with that goal! The Silhouette has first was very overwhelming! So many projects, so many features, I had no idea what I wanted to do first!!! I have a Cricut, but it's the older version were you need the cartridges. The Silhouette had so many more options - I had font choices, I could cut fabric, vinyl, paper, cardstock you name it this machine could probably cut it! Plus, the endless list of cute projects I had pinned on pinterest! I was a like a kid in a candy store!!! I didn't know what I wanted to make first!! So that is why I made it a personal goal this year to do at least one new project ta month on my silhouette! I found this pack of 4 tumbler cups at Sams Club, so I snagged up a box. When I first saw the cups, I knew I exactly what I wanted to do with them! I don't know about you, but I love monograms! 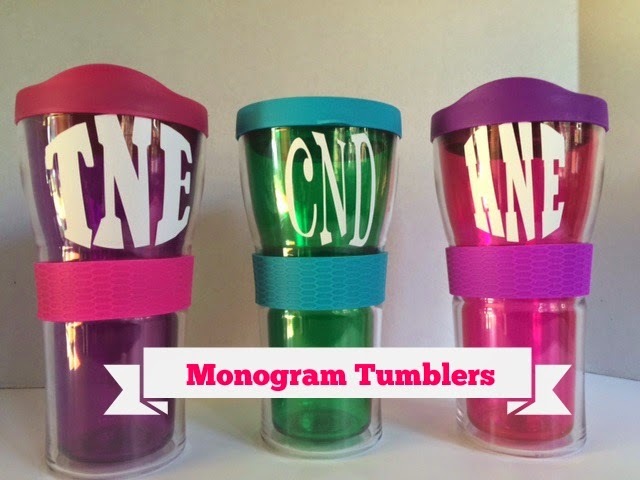 If it's monogrammed you can probably bet I will buy it! So for this project you will need a silhouette cameo or circut explore to cut the vinyl. The tumblers are super easy to make and make awesome gifts! You can even fill the cups with treats or gift cards! Because, I have a silhouette cameo I'm going to share the screen shots from my silhouette design software. There are so many great videos on youtube, but this is one I watched as a tutorial on cutting vinyl monograms. I played around with a few fonts, but I think my favorite font for circle monograms is IMPACT. This project took me about 15 min per tumbler!! At first, the thought of doing a vinyl project seemed so intimidating but I now love working with the vinyl!! I have not tried a circular monogram yet, I actually bought a camelback at Target for my workouts and I want to add a monogram to it. Its my next Silhouette vinyl project! !